Finally, after a month of menstruation it finally stopped. I was diagnosed before of hormonal imbalance and until now it is still not corrected. There is a four-month interval in between menstruation and one month of menstruation. If three days of menstruation is already a hassle, how much more if enduring it for a month. But thank God I was able to survive it and found some means to endure it. First thing is of course my ever reliable "Sisters" which had never put me to shame. 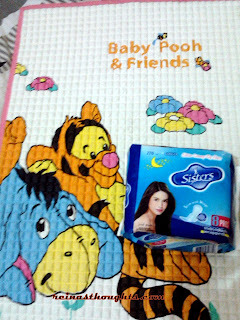 Though this is not a paid post by them, I am happy to share that "Sisters" is a very reliable companion, I am using the blue one brand which is for heavy flow and for night use because regular type wont work for me. I also like to use it because aside from its reliability, it is also very affordable. Also while sleeping I also have my rubber mat. It was really designed for babies but I am using it to prevent from staining my bed sheets just in case there would be leaks. With the rubber mat, it would be a carefree good night sleep. In terms of regaining my strength during these times, I am eating a lot of nutritious food and more on foods with Vitamin A and Iron. I mostly eat cooked chicken or pork liver and eggs and drink a lot of pineapple juice. I also intake ferrous sulphate tablets. I also never involved myself in any tiresome physical activities during these times. I really thank God that I never fainted during these times but I would really consult it again to another OB-Gyne and hope these time it would now be corrected. i hope everything will be alright soon..